The portion of the building we refer to as ‘the chalet’ was built in the 1930s as a satellite sales office for Strong Motors, a Ford dealer out of Atwater, MN. They sold Model As and Ts, I am told. 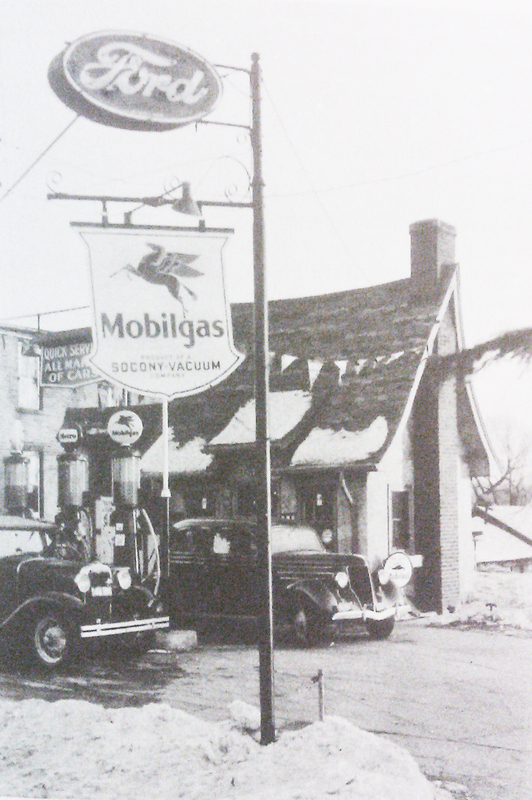 Sometime later (dates are mushy around here), the building changed hands and was converted to a Mobilgas station–classic pumps are shown in the picture above. At this time, the road still ran across the front of the building. Boy, what I wouldn’t give today to have some of that gorgeous signage shown in the old photos! 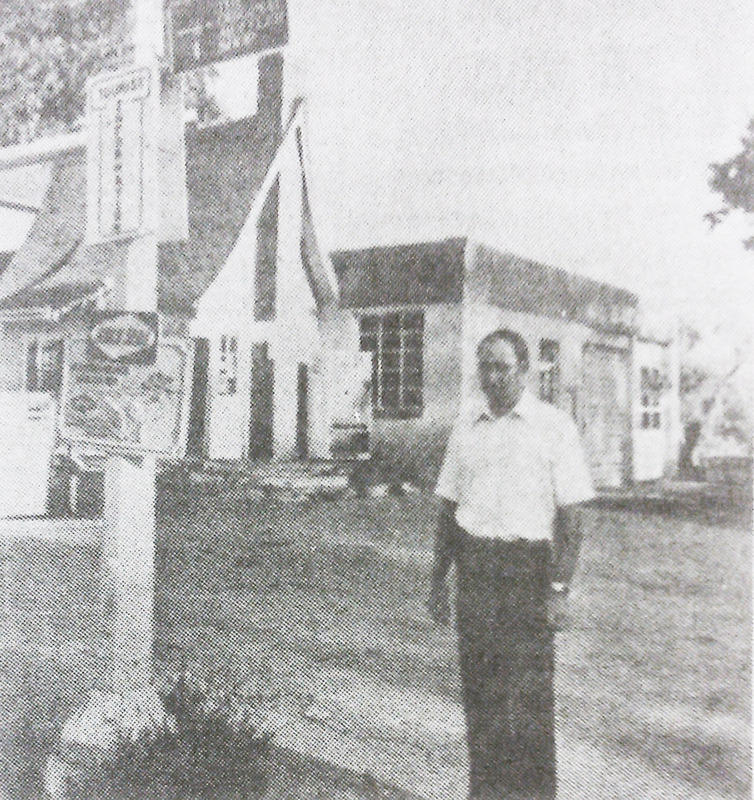 The picture above shows our little gas station next to two residences that were eventually torn down to clear the way for County Road 9 to cross the Mill Pond and run straight through downtown New London. This decision is what led to all the semi-trucks running past my office window today. It is not hard to like these old buildings better. The photo above shows the left side of the chalet with the service bay built on it, but not much else. It also has a door on the center of the building and behind the chimney. None of that is true today, but when we tore all the walls out we could see the remnants of this former structure. I can hardly believe our luck that this weird little building has survived all these changes and years. There are quite a series of owners on the abstract of this property, and as soon as he can, Ryan will attempt to sort it all out. Did I mention he is also the Historian? 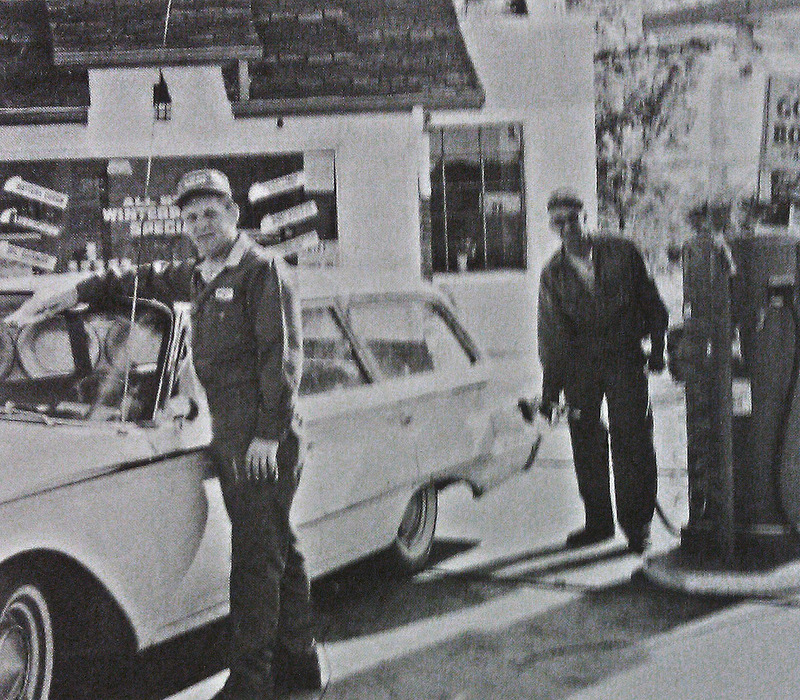 This photo is the closest thing I have to a photo of the previous owner–it is Willard Lindquist, Mark’s father. Willard retired after Mark sold the place, but he has come by a couple of times to check out what we have going on around here. This fella has a lot of information!